Chosen as one of Mensa's top five games soon after its initial release, Quiddler has become a popular game among children and word game aficionados. Also known as "the short word game," it is both a word game and a strategy game that children and adults can play together. While having an extensive vocabulary may prove helpful when it comes to creating words, the game is not so much about the quality of the words as how well you create them. The word "zoo" could easily outscore the word "quince" if played properly during the game. Quiddler consists of 118 cards. Each card has one letter of the alphabet on it, with the exception of 10 double letter cards that feature CL, TH, IN, QU and ER. 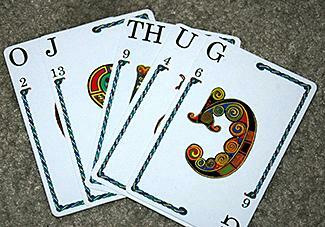 The object of the game is to use these cards to spell words and generate the most points in the process. Designed for ages eight and up, Quiddler can be played with one player or as many as eight players. While a single player can often finish the solitaire version of Quiddler in 15 to 20 minutes, it may take a larger group of players 40 minutes or longer to finish a game, depending on how many words are challenged. Quiddler can be found in the game section of most toy and book stores, including Barnes and Noble. In addition to the basic version of Quiddler, more serious players can buy special versions of the game. Quiddler Deluxe comes with the Quiddler Short Word Dictionary and a score pad, all in a decorative tin. Setup for Quiddler is very easy. The dealer shuffles the cards and deals three to each player. In each subsequent round he or she deals out one more card to each person. This means that the next round each player gets five, and so on. At the beginning of the eighth and final hand each person will be dealt 10 cards. The dealer places the leftover cards in a stockpile face down and flips over the top card. The person sitting to the left of the dealer starts the game. This person either picks up the face up card or draws from the stockpile. At the end of the turn, he or she must discard one card face up. Play continues to the left, around the table. Players cannot lay down any cards until they are able to use all of them to spell one or more words of two letters or more, or until another player has already laid down his or her cards. Each round ends when one player is able to lay down all the cards in his or her hand at the end of his or her turn. This person is not automatically the winner. Once this happens all of the other players get one additional turn. Then they lay down what they can. The point totals on the cards are added up, and players with cards still in their hands subtract these point values from their total scores. The player with the longest word gets 10 bonus points, as does the player with the most words. If there is a tie in either area, no one gets that bonus. At the end of the round the dealer records the scores, collects the cards, shuffles them together with the discards and the stockpile and redeals. If someone thinks a person played an illegal word or a word that does not really exist, he or she can challenge. If the challenger wins, the person that played the illegal word has to subtract the points the word adds up to from his or her score. If the player wins, the challenger must subtract those points. For the purpose of challenges, all players agree on a dictionary to use before the start of the game. 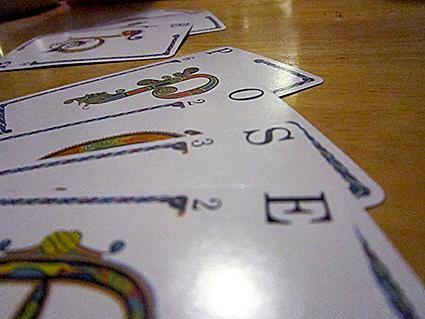 When people play Quiddler, they may originally strive simply to create the longest words. It's important to note, though, that these long words will not necessarily win the game. The strategy here is to get the best combination of letters to score the most points. This means that a person who still has cards in his or her hand may actually score higher than someone who lays down every card. You can build your Quiddler skills by checking out the Quiddler Daily Challenge online. Even though you do not have to play big words to score in Quiddler, it helps to have a strong vocabulary. If a game of Quiddler is in the future there's no shame in spending a little time reading the Quiddler Short Words Dictionary and brushing up on some two and three-letter words. As you play, you can also learn from your opponents by taking note of the words they play that give them high scoring opportunities.